You can rely on Tritons to take care of sustained high volumes in your living room, garage shop, dance party, warehouse, backyard, outdoor party, small vocal PA, or stage monitors. In almost any situation, the Triton will deliver a pleasing mix. The Triton's 8" paper dual cone full range drivers run without signal filtration. Due to the design of the cabinet volume, this tweeter and 8” driver combinations delivers a smoother gentler sound that will not overwhelm a smaller space. The tweeter implementation is similarly designed to align properly with the driver at either low or high volumes. The combined sound of the Triton drivers wide range/full range plus super tweeter is smooth, detailed, organic, and dynamic. The high frequencies are completely non-fatiguing, yet well defined. The Tritons are the logical step up from the Orca 3" driver sonic signature. Some folks enjoy the additional support of the Benthic Subwoofer tuned lightly with the Triton. For that extra smooth lower range this is recommended, however, these speakers have been engineered to work well independently. 1 watt - 300 watts available per channel depending upon the desired kind of performance. Low powered SET tube amplification will more than liven up your living room, and with higher power solid state and digital amplification technologies, Tritons will play all the way up to the levels needed for public address systems, live rock or even dub reggae music. Just a pair of Tritons will handle most dance parties. But if you have larger audiences, a 4 pair array like the revolutionary Octopus cabinet design does not lose pace, and will lay out a massively clean mix to satisfy larger parties. Triton, the messenger of the sea (of music), is adept at the refined, emotive playback of every musical style between classical music and hip-hop. They are versatile and warm, lush, smooth - not your typical unrefined-sounding modern speaker design. This is due to their reliance on a vintage style - softer than average and (of course!) all paper cone for the primary frequencies up to 10khz. From 10khz up, a soft dome super tweeter takes over. These are either great living room speakers or high power near field studio monitors. Tritons are extremely versatile, yet handles over 10x the wattage that an Orca 3" full range can do. Even though they handle power with grace and profundity, just like any Blumenstein speaker design does, they are also great for use at low volume levels as well. Then, in the quick twist of the volume knob, you can pump them up to sustained high volumes in your living room, garage shop, dance party, warehouse, backyard, outdoor party, small vocal PA, or stage monitors. In almost any situation, the Triton will deliver a pleasing mix. Their lower bass cutoff means that you are less likely to need a subwoofer (that said, the Benthic Bass Unit design does a phenomenal job of covering the narrow band of lower frequencies that the Tritons do not get to - below 45 Hz). If you wish to go further than the 5 1/4" Benthic subwoofer for the Triton, and venture into an ultimate subwoofer arrangement, I would recommend any of the options from SVS brand Subwoofers. While the 3" full range driver designs like the Orca and Marlin have better imaging, dispersion, flatter frequency response, are more compact, one must also consider that all of Blumenstein speakers, including the Triton, excel at low volume performance. It is the common performance attribute. The Triton should be thought of as a speaker that sounds mostly like an Orca yet that simply goes up to much higher volumes. The Triton's 8" full range drivers are being run without any signal filtration. The natural 8-octave range of the 8" paper dual cone full-range driver is subtly augmented for the last octave (10000 Hz and up) by a 1" ferrofluid-cooled neodymium magnet super tweeter which is elegantly crossed with a single, high-quality Solen capacitor. The tweeter implementation is similarly designed to align properly with the 8" wide band driver at either low or high volumes. The combined sound of the Triton drivers wide range/full range plus super tweeter is extremely smooth, detailed, organic, dynamic. Fans of the original Thrasher designs from 2006 to 2016 stayed in touch and kept pushing to take that design further, and the Triton (2016 - ongoing) is the fulfillment of that quest. Various iterations of the Thrasher were in continuous production since 2006 under the Blumenstein name, however, the history of the Thrasher goes back much further than that. As a quick point of reference, the early Thrashers became known for their "skater punk" rough particle board finish but excellent sonics. 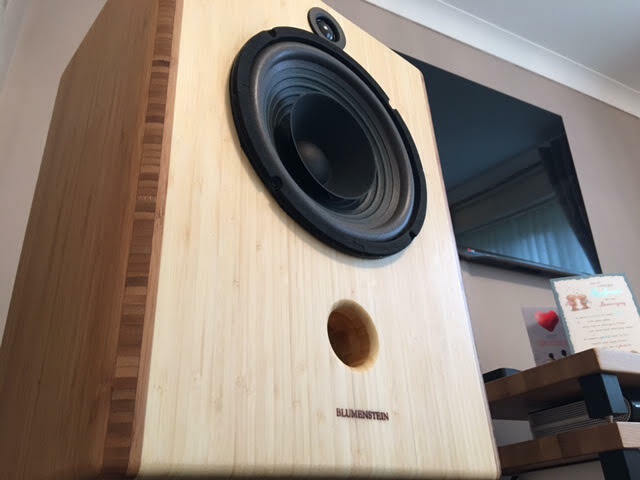 The Triton 8" Fullrange, on the other hand, is now only offered only in fine finish 3/4" Birch plywood and Bamboo ply with new solid wood internal bracing and numerous upgraded acoustic and electronic components. 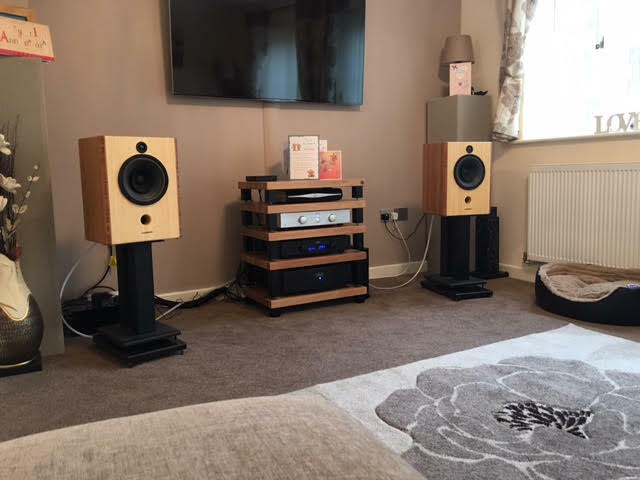 The main drivers used in the Triton are still the same newly produced classics of a 40+year-old classic 8" paper cone full range driver design originally produced by Pioneer in the millions of units sold. The new Tritons are some of the finest sounding enclosures ever made for these 40+year-old classic full range drivers or the new GRS reproduction units that get modified in-house to become the Triton drivers. When I began apprenticing at Cain & Cain, there were many other promising big full range drivers out there. Over the years, I have had a chance to own most (hundreds) of the different promising full range models from various manufacturers. Often, there would be so much about the sound that I would initially gravitate towards, but then eventually a wrinkle in the sound would come to light and then that would eventually become all I could hear in that driver. For a variety of reasons, the Pioneer 8" full range somehow continue to strike the ever elusive balance of always sounding good with any music - anything between Classical and experimental electronic. This likely has to to do with the original and reproduction Pioneer 8"'s prodigious historical and ongoing production numbers in parallel with generations of music history. By now, I have owned dozens and dozens of different 12", 10",9", 8", 7", 6.5", 6", 5", 4.5", and 4 inch full range drivers, from almost every price-point and from nearly every pertinent full range driver manufacturer domestic and abroad. I typically tried out these drivers in more than one test enclosure of my own design, after building what the factory recommended. Eventually, I realized that I was going to get nowhere if I kept hopping on other peoples' bandwagons - chasing after ever improving specification figures and ever more exotic construction and flavor-of-the-month design methodologies like most of the competition in the speaker industry does. Each time I kept circling back to the Pioneer 8" design I was able to tune them to ever higher levels of performance. This process of refinement too place gradually over the past 12 years, which has been incredibly gratifying to me as a designer to be present for each stage of improvement. The Pioneer's inherent cone construction is light and simple. The most important trait - rarely for almost any 8" full range, the Triton driver does not sound too bright in the upper midrange. This gives me alot that I can work with. This chameleon-like, creamy midrange, gave me the ideal foundation upon which to dial in a super tweeter into a balance of nuance and additional transparency. When designing luxurious sounding full range speakers, it is good to have a long-term musical benchmark. Fortunately for me, I've had that ideal kind of collaboration with a higher end full range speaker driver company. Feastrex drivers, which I also sell (>100x the price of the Pioneer/GRS drivers) do use exotic materials. Feastrex drivers employ guaranteed pure and entirely custom metallurgy, custom papermaking, and skilled, low volume machining and assembly methods in Japan that simply cannot be compared to the other so-called "high end" full range driver companies out there using off the shelf magnets and high-speed assembly line style production techniques. Feastrex, on the other hand, takes a purely artisanal approach, and this has informed much of the direction we have taken my production (non-custom) loudspeaker brand in general, and especially so with the Triton. The Feastrex drivers constructed during my apprenticeship to Feastrex in Japan 6 years ago have also been installed in several different cabinet iterations made by Blumenstein Audio and have always stayed in close orbit to the listening room. Feastrex drivers have been an undeniable influence on my production loudspeaker designs. http://www.pranawire.com/cain&cain.htm (Cain & Cain speakers are no longer in production). As it turns out, my first audio mentor Terry Cain actually had a pair of these 8" pioneer drivers as the shop HiFi speakers and had installed them in hundreds of his projects from the 70's thru the 90's. So it is notable that even before I'd apprenticed with him, Terry had been a fan of these drivers a long time before that. During the course of our listening to these drivers together in the woodshop during his lifetime, we both knew that there might be something in these drivers that had a little bit more than just "shop speaker" credentials. Operating as Blumenstein Audio, as I continued to keep tabs through the years listening around to what sort of esoterica everyone else out there in the wide-ranging audio community is enjoying, I have kept circling back to these also popular Pioneer/GRS 8" drivers. They have a devoted following beyond Terry Cain's work or my work with them, and for good reason. 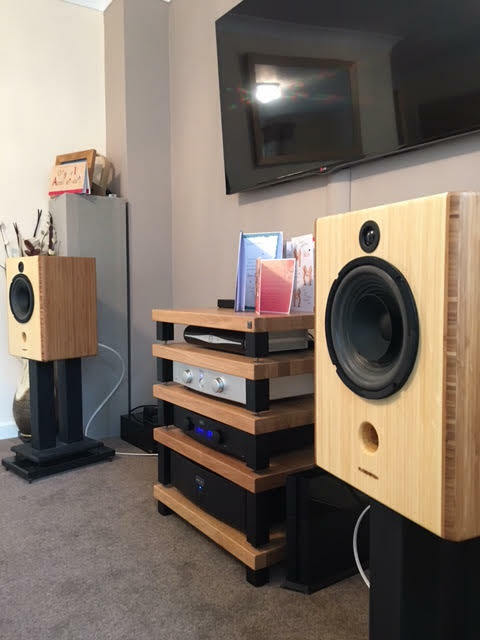 What I kept hearing from my clients is that the midrange out of the 8" full range design is strikingly beautiful once the cone is fully broken in. The Tritons are also chosen as the most logical step up from the Orca 3"s sonic signature. As it follows, the high frequencies are completely non-fatiguing, yet well defined. The rare earth neodymium magnet ferrofluid-cooled 1" super tweeter is gently crossed over by a precision audio capacitor in order to cover the region above 10000 Hz. This iteratively voiced super tweeter implementation across generations of Thrashers and early Tritons has always melted seamlessly into the sound of the Pioneer 8" full range. In order to further facilitate the sonic blend, in production, a specific internal hookup wire and soldering technique has been voiced over generations of prototypes and production models. While many might believe a speaker that responds as low as the Tritons would make a subwoofer unnecessary, (and for their own tastes in music, they might be right!). If you chose to add a subwoofer to your Triton setup rest easy knowing that you can use either a cheap major manufacturer brand of a subwoofer, all the way up to a high-end audiophile or studio subwoofer. The trick with properly setting up a subwoofer with the Tritons is to know that the Triton's already robust bass will not need much additional support. So tuning the subwoofer in lightly is key. However. If you go with a Blumenstein subwoofer system, you should consider at least a pair of Benthic Bass Units - these are great at low volume subwoofer support for the Tritons because of the cabinet acoustics and the neodymium magnets.. Larger subwoofers may become available from Blumenstein in the future, but for now, I'd invite you to peruse the offering of SVS or any other leading subwoofer manufacturer for larger diameter subwoofers for use at high volumes with the Tritons. The Triton's uniquely creamy midrange, just like that of the Orcas, comes in part from its delicate sounding, thin paper cone and soft suspension construction. Yet, counterintuitively, this smooth quality in midrange also comes from its relatively "normal" ( i.e. not-exotic), ferrite magnet. The creamy midrange from the 8" driver gets sandwiched between the incredible speed of both the Triton's own rare earth neodymium magnet super tweeter and also the rare earth neodymium magnet sound quality of the Benthic Bass Unit. This effect of stretching the dynamic qualities of only the frequency extremes serves to increase the communicative power of the music coming from that smooth sounding 8" in a stealthy way that is indefinitely enjoyable. Public address roots behind the Thrasher began the quest for the ultimate mega-sound system and true 100+db efficiency that has finally resulted in the Octopus model. If you are planning on running 4 pieces per channel Octopus arrayed Triton then prepare for seismic activity! The Triton was officially released November 2015. Thrashers were in production 2006-2015. The Thrashers in cheaper plywoods were discontinued because the sound quality of the furniture grade quality plywoods was that much better. Solid Douglas fir wood for internal bracing, a better neodymium super tweeter, internal wire, and crossover capacitor gave additionally undeniable improvements. The newly offered fine finish quality of the Triton is now the same as the Orcas and Marlins, and along with the upgraded internal parts that serious audiophiles who were fans of the original Thrasher started to ask for, the Triton is the fulfillment of a long quest for a rock solid livingroom filling large bookshelf size speaker. Thrashers plus the new DOF kit: as good as a Triton? All Tritons, including any currently on order, are being outfitted with the full complement of parts that you can order in the Depth of Field Enhancement Kit, as well as other enhancements native to this speaker design. These components were 10 years in development as of January 2016, but are applicable to older Blumenstein models. If you have any old pair of Thrashers and want to upgrade the sonics to levels approaching that of the new Triton (minus the effects of the fancy solid Douglas Fir bracing), then a quick application of the DOF kit will get you rocking out even harder than ever before!